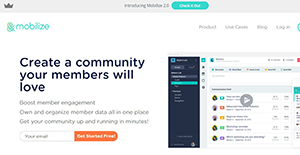 Mobilize is a scalable, cloud-based communication tool that enables organizations to build connections and abridge relationships with its members. The platform provides a centralized place where users can organize, manage, collaborate, and communicate with members and groups. Its robust features help boost the engagement and grow the network of volunteer groups, alumni networks, and other communities. Mobilize simply create a space for your community to integrate, collaborate, and grow. Its features are expertly crafted to help keep privacy at your preferred levels and give members unique admin permissions. Some of its main features include: group messaging, registration forms, subgroups, member database & CRM, online community management, Polls, member profiles, smart analytics, and event management. Mobilize is a robust web-based communication tool that empowers communities to send messages, share files, and organize events. The platform allows users to create detailed member profiles, member cohorts, and subgroups with unlimited customizable data fields to store dates, texts, links, locations, files, and more. Member information is stored in a centralized network directory to ensure total data security and easy filtering using various criteria. The platform is also built to offer frictionless communication. It provides a streamlined way to engage your members via SMS, emails, polls, or events invites. It helps individuals by offering reliable features crafted to manage communication at scale. Whether it’s sending or organizing poll responses, hundreds of Emails and SMS, and events RSVPs, Mobilize makes all that happens from a unified dashboard. The dashboard is a single control center designed specifically for users managing large groups and unlimited messages and alerts. With the software, member engagement, authentic group outreach, and support are a breeze. The CRM and member management tools support hassle-free member management. The features provide smart filters and custom fields that enable you to explicitly target groups in your databases. Besides, the rich member profiles enable you to understand more about the group members. This enables you to scale with ease and segment your contact list quickly. It helps you come up with as many subgroups as you want under a common network. Enterprises have different wants and requirements and no software solution can be just right in such a scenario. It is useless to try to find an ideal out-of-the-box software app that meets all your business wants. The intelligent thing to do would be to adapt the system for your special needs, worker skill levels, finances, and other factors. For these reasons, do not rush and pay for well-publicized leading applications. Though these may be widely used, they may not be the perfect fit for your particular needs. Do your research, investigate each short-listed application in detail, read a few Mobilize reviews, speak to the seller for explanations, and finally select the product that offers what you need. How Much Does Mobilize Cost? Mobilize provides detailed SMB and enterprise pricing plans crafted to meet the needs different communities at any stage. We realize that when you make a decision to buy Communications Software it’s important not only to see how experts evaluate it in their reviews, but also to find out if the real people and companies that buy it are actually satisfied with the product. That’s why we’ve created our behavior-based Customer Satisfaction Algorithm™ that gathers customer reviews, comments and Mobilize reviews across a wide range of social media sites. The data is then presented in an easy to digest form showing how many people had positive and negative experience with Mobilize. With that information at hand you should be equipped to make an informed buying decision that you won’t regret. What are Mobilize pricing details? What integrations are available for Mobilize? If you need more information about Mobilize or you simply have a question let us know what you need and we’ll forward your request directly to the vendor.